Advantages & disadvantages of Custom Toolbar Button & Shortcut Menu Button for displaying the Calendar Control and whey we need both? When there is no need for a Calendar Control on a Form how to disable the Buttons? When the Target Control is not a Date type field how to prevent the Calendar from appearing? Do we need the Custom Toolbar or Shortcut Menu Button to display the calendar, is there any other method? Let us look into the above Questions, one by one. The Custom Toolbar Button creation method was easy to explain without going too deep into the Shortcut Menus. Shortcut Menus are Popup Class of Menus and different from Toolbars. We will learn more about creating Custom Menus, Toolbars & Popup Menus for our Applications later. To run our Calendar, the easiest option is using the Shortcut Menu button. We can right-click on a field to make that field active and then click on the Shortcut Menu button, which appears near to the field. To use the Toolbar button, which normally appears at the top, first you must click on a field on the Form to make that field active and then go up and click on the toolbar button. And every time we will be going up and down this way to use the Calendar. 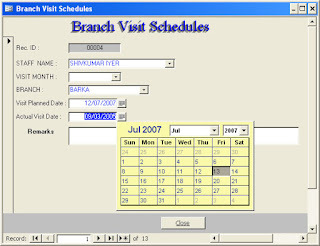 Since, the button that we have copied is on a built-in Shortcut Menu, when you open another database on the same machine (with the Calendar Control and its associated programs of course) the button on the shortcut menu will be available to display the Calendar Control, but not the New Toolbar that we have created in the other database. This trick will work only on the Machine that you have created the button on the built-in Shortcut Menu. If you open the same database on another machine the shortcut menu button will not appear there. But the Custom Toolbar Button goes along with the Database to the new machine. We can easily make a copy of our toolbar button on the shortcut menu while installing our Application there. 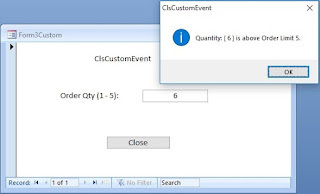 If we need a copy of the Custom Toolbar in a different database then open that database and Import it from the one, which already have the Custom Toolbar. Select File - - > Get External Data - - > Import Option and select the database that you already have the Custom Toolbar and click Import button. Click the Options>> button on the Import Objects dialogue control to display the import options section and put a check mark in Menus and Toolbars. 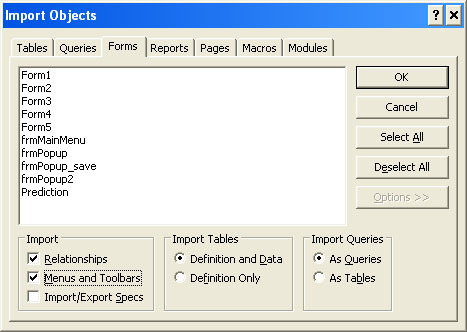 Don't select any of the other objects like Tables, Query and Forms etc. Only the Menus and Toolbars will be imported. So we have the advantages of both options, in such situations. There must be a way to restrict the use these Buttons on specific locations where we actually need it and put away or disable it in other times. This way we can prevent the user from running the program by mistake. Then, there must be a way to address our Button through Code and enable or disable it at situations that demands it. The best approach is disabling the buttons at startup. 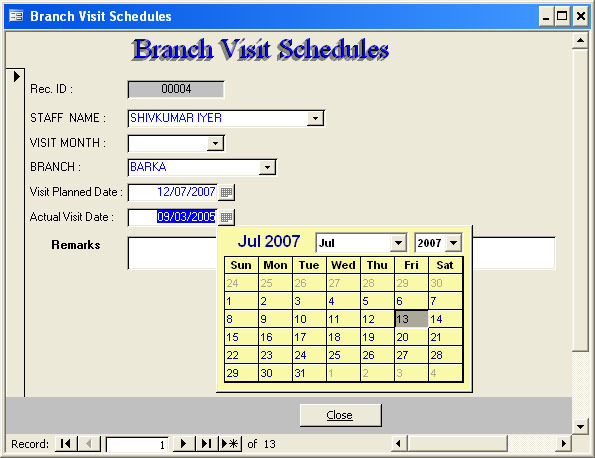 Enable the button when the user opens a form with the Calendar Control. When the form is being closed disable it again. The Menu Bars, Toolbars & Shortcut Menus falls into a Class of Objects known as Commandbars Collection and each Commandbar have a name and an index number. We baptized our Custom Toolbar (Commandbar) as ToolCal (Toolbar for Calendar in short, what a name!). Each Button also falls into the category of Commandbar.Controls; we have named our button as Calendar, so easy to remember. With this background knowledge we will deal with the enable/disable business. Copy the following Code and paste it into the same Global Module where you have copied our earlier routines of the Calendar programs. We can run this routine by adding a line of code in the appropriate locations on the Forms. Cbr1.Enabled = False will disable the full Toolbar controls, which means, if you have more than one Button on the Toolbar all of them will be disabled. cbr2.Controls ("Calendar").Enabled = False: Here we are addressing a particular button on the 'Form View Control' CommandBar to disable only that button leaving others untouched. EnableDisable 0 ' 0 to disable and 1 to enable. All the fields on a Form don't need the use of the Calendar. Since, our Calendar is any time anywhere type implementation we need to limit its activity where we actually need it. As I have mentioned earlier we need little more code to do this. Before we go into the code let us list out the steps that we need to take, to write the code when the user clicks on the Calendar Button. We must see whether this control is an Unbound Text Control or a Bound Text Control linked to a table or Query field. If it is an Unbound Text Control but it is intended to accept a date then we must identify the control by checking its Format Property or Input Mask Property, which of course we will be designing and setting it up for the convenience of the User and for us too. If it is a Bound Text Control and the Format or Input Mask Property is already set with appropriate string values it will make the task easier. Otherwise we have to take the Control Source and Record Source Property Values and go deep into the Control Source Table or Query and pull out the Data Field and check its type and determine whether it is a Date type field or not. Any way, we must be prepared for both situations. Once we got the result of the above validation we can determine to show or not to show the Calendar. MsgBox "Sorry, Not a Date Type Control." I hope this will clear things up and you will be encouraged to start experimenting some of these methods and if you have different ideas, please share them with me. This is the first time I am coming to this page. Good stuff! :-) Is it possible to write an access macro for a linked excel table that can ativate another macro within the excel table? Welcome to the Site and thank you for the compliments. It is Possible. I will publish a Post at a later date with more details. In the meantime try this: Write an Automacro first in your Excel File. Open your Excel File (say Test.xls) and display the VB Module (Tools - > Macro - > Visual Basic Editor). Double-Click on the Thisworkbook object at the left side window. Its empty Code Module will display at the right side . 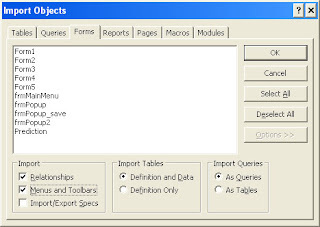 Select Workbook from the top control where (General) is shown. Two lines of Code will display automatically as shown below except the middle line. The middle line you have to write. If the Code displayed is not the Workbook_Open() Event Procedure then select Open from the (Declarations) control above. Save the Excel file as C:\Test.xls. The Excel File will open and show a warning message about the Macro. Click on Enable Macros button after that you will see the Welcome Message that we have written in the Workbook Open Event Procedure. I will bring out more details on this, like how to check and find which excel file is linked into Access and how to find its Name with code and automatically open the Linked Excel File. How to Link External Data Files, like Dbase, Excel, ODBC etc. will be explored.